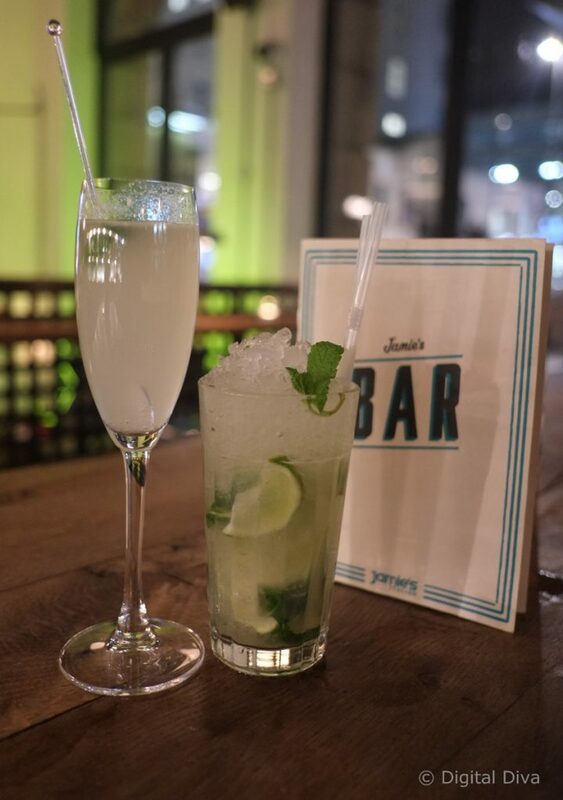 Recently we visited Jamie’s Italian Restaurant in Leeds for a mid-week treat. I’ve been once before when it first opened, but couldn’t really remember what the food was like so thought this would be a good opportunity to review a-fresh. For cocktails, I chose the Grey Goose Le Fizz (Grey Goose vodka, St Germain elderflower liqueur, fresh lime & soda) and the husband went for a mojito. He’s a mojito aficionado and very picky! He proclaimed the mojito to be very good, I tried it and it was! It was quite a bit better than my Grey Goose Le Fizz, which really tasted like a fresh lime and soda. The elderflower liqueur taste just wasn’t there, which was a shame. For nibbles, we had the pork scratchings with fennel salt and orchard dipping sauce and the ‘World’s Best’ Olives on Ice (with black olive tapenade & music bread). 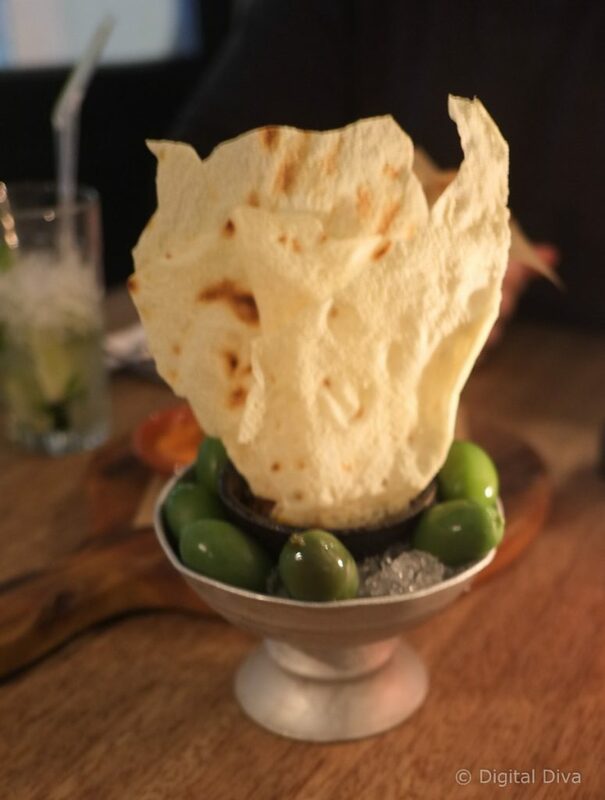 The olives did live up to their name. I do love italian olives way more than spanish or greek, I love the buttery-ness of them! The tapenade was really tasty too, definetly some of the best I’ve tasted. 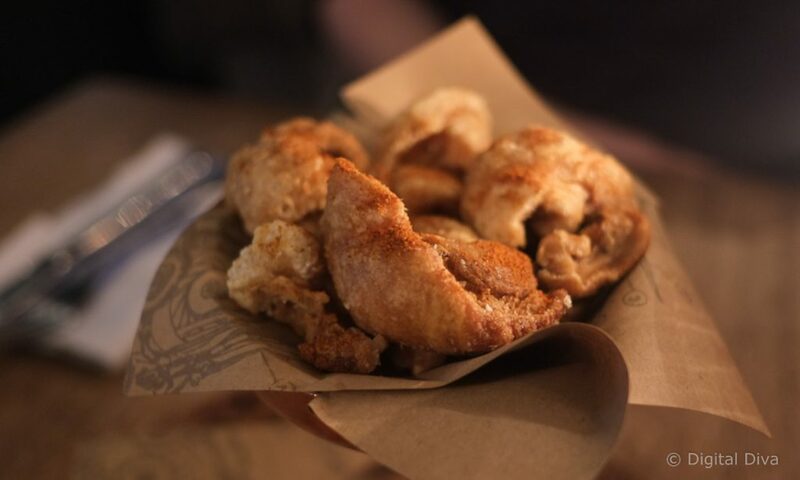 The pork scratchings, however, were disappointing I’d say… we love pork scratchings but these were quite dry and we couldn’t taste any of the fennel salt. We added salt ourselves from the salt shaker, but didn’t finish them. 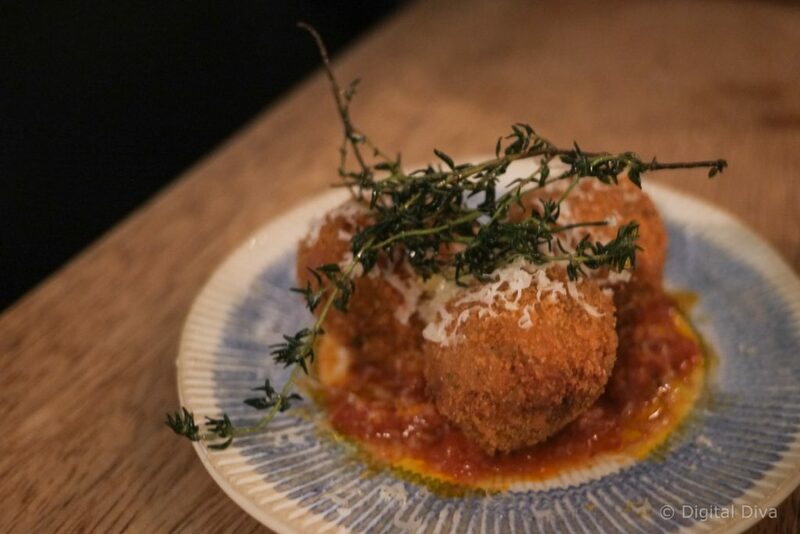 Moving onto our starters, hubby went for the crispy porcini mushroom arancini (fried balls of porcini risotto with fontina mozzarella and arrabbiata). The sauce was lovely a spicy, a perfect arrabbiata. The porcini mushroom was a bit lost in the flavours, I’m not a mushroom fan but did have a try and I couldn’t detect the taste…maybe they would be better advertised as mozzarella arancini with arrabbiata? 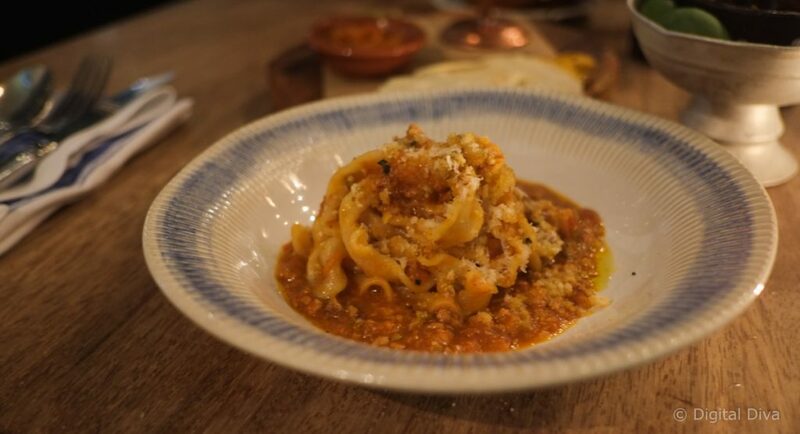 I went for Jamie’s Sausage Pappardelle (ragu of slow-cooked fennel and free-range pork sausages with chianti, parmesan and herby breadcrumbs). The pasta was cooked perfectly, al dente…and the sauce tasted really tasty. Lovely. At this point we ordered more of those lovely mojitos. Yum. 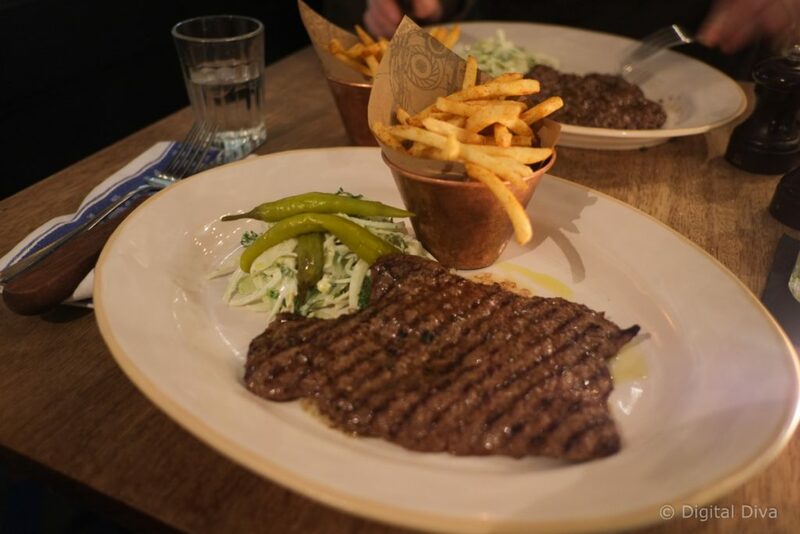 For mains, we both went for the Italian Steak Frites (marinated and chargrilled featherblade steak, Italian-spiced skinny fries, pickles and crunchy kale slaw). The steak was just gorgeous, seasoned beautifully and cooked well. The fries were also perfectly cooked, just the right amount of crispiness and the spice on them worked really well. The kale slaw was really more of a slaw (mainly onions) with a tiny bit of kale…but it did taste really good. 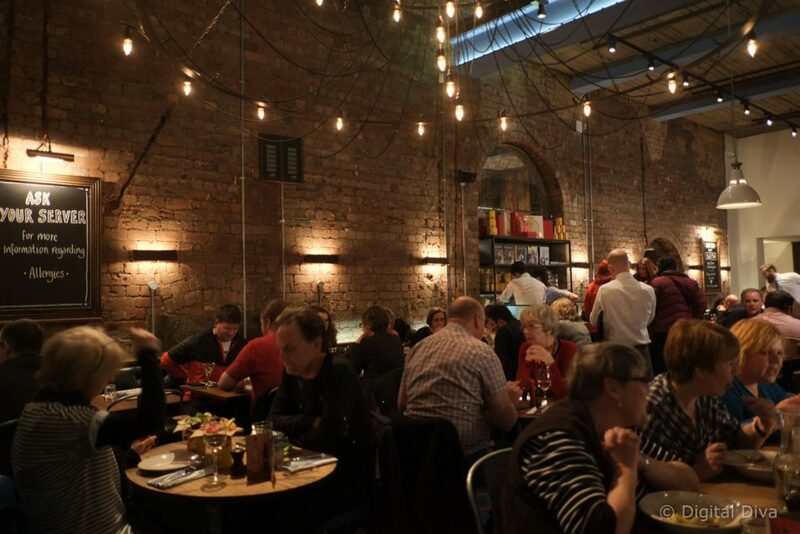 Jamie’s Italian in Leeds is definitely one of the best options for chain restaurants. The atmosphere is good, the staff are very helpful and the food on the whole is great. I wouldn’t order the pork scratchings again or the Le Fizz cocktail, but everything else I would definitely go for again. You can find the restaurant on Park Row here. Please note: I received a discount from my bill to say thank you for reviewing, however my opinions were not affected at all. I’ve been to the one in Edinburgh and was so I pressed. 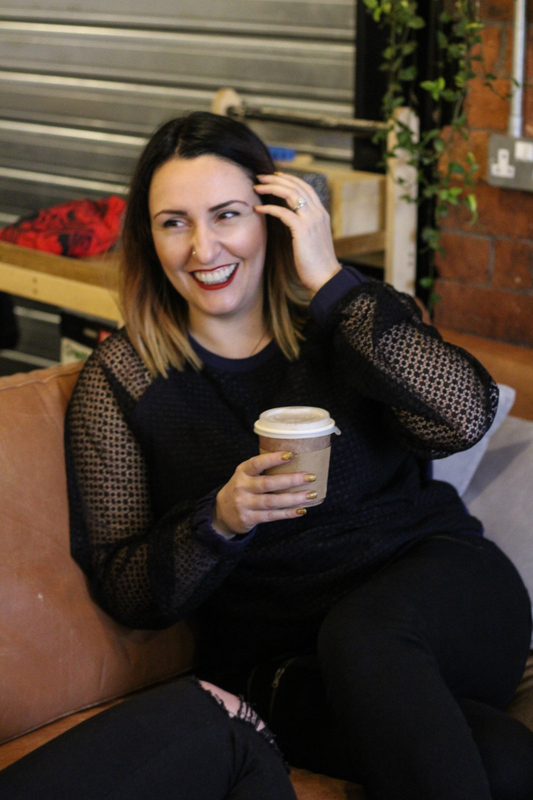 Loved the atmosphere, the decor and found the staff to be really attentive & friendly. We visited during the Fringe festival when everywhere was extremely busy but still nothing was too much trouble. The food was beautiful too. Definitely want to visit one of his restaurants again! Woops, I meant so pleased!! Mmm this looks delicious! Ive never been to any of the Jamie’s Italian places but definitely intend to some time soon!